ParcelRewards recognises and rewards you for the parcels you send with us. The discount applies for the next year. You could be earning your way towards a discount. Sign in or register for ParcelRewards. * total accumulated over past 12 month period. See terms and conditions. 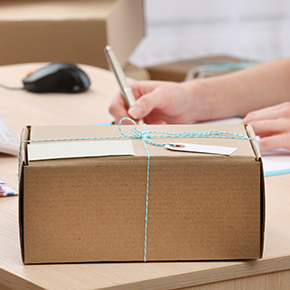 If you send lots of parcels, you should get rewarded for it. ParcelRewards does just that, giving you a little something every time you send. It's easy, simply sign up. Then spend over $50 online on eligible parcel-sending products - like print postage online, packaging, and postage-included bags to qualify for your first discount tier. You'll be surprised how fast it all adds up. 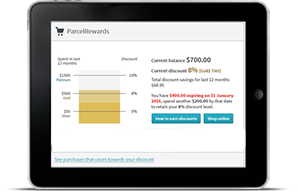 ParcelRewards has an online dashboard that enables you to easily keep track of your transactions and the status of your latest tracked parcels. There are also handy tools available like one that lets you integrate ParcelRewards with your existing Trade Me account. Whether you send gifts to family or friends, or you're an online trader, when you spend over $50 you'll be rewarded with a 5% discount. The more you send the better the reward. Once you've reached a ParcelRewards discount tier you will be eligible to receive this discount over the next 12 months. See the ParcelRewards FAQs page.